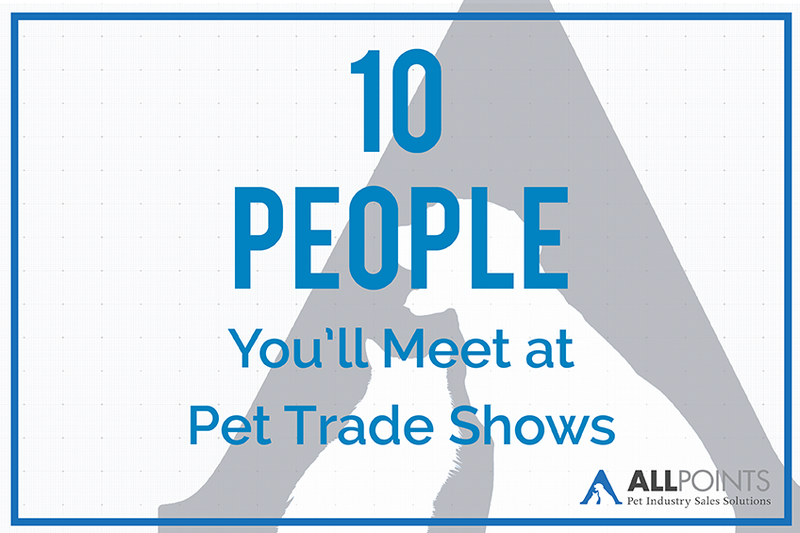 If you've ever been to a pet trade show, it's likely that you always expect to run into the same people. This is especially true if you've been in the industry for what seems like forever. However, even if it's your first trade show, you've probably heard your colleagues tell you horror stories about Mark. Oh Mark - wait wasn't he the one who was super aggressive and always in your face about his "newest and greatest ever" dog toy? Oh - that Mark. SuperZoo is coming up so we thought it would be good timing to warn you to keep an eye out for these ten types of people you're sure to encounter at the show. Bob's the kind of person who needs to know everyone going to any event at any time. It can become overwhelming when he stalks social media channels (#GlobalPetExpo anyone?) to link people together. This way, he discovers who is going to the upcoming pet trade show and how they do business. Fortunately, Bob's easy to talk to, especially if you're someone he'd consider as a somebody to know. He will also know a ton about your competitors and your company - probably even better than you do. Let's be real. Katie isn't interested in placing an order for a manufacturer's cat condos or new limited ingredient pet treats. What she is interested in, however, is whether they are giving away any of their samples at the end of the show. Katie knows manufacturers don't usually bring their trade show samples home, so she knows the right time and way to ask for all their supplies. It usually causes not much more harm other than possibly getting in the way of your last-minute appointment with the manufacturer when they have no samples left. Oops. You don't even have to strike up a conversation with Matthew to know he really doesn't want to be there. In fact, the only thing he's happy about is getting drinks at the end of the day. He won't really be enthused about the show or the pet products and won't be very fun to talk to. In order to avoid some negative vibes, we'd advise keeping away from people like Matthew because they'd rather be sitting at their desk and sending off a couple emails and calling it a hard day's work. Have you heard about the latest and greatest piece of technology ever to hit the pet industry? Ryan doesn't even know how the industry has managed to even exist this long without his new app that makes shopping in stores so much easier. Ryan's booth is probably not much more than a table with a piece of fabric draped over it and a picture of a puppy as the background and an iPad on the table However, he spent so much money to be there, so you might as well give his product a try, right? Keynote speakers are great because they usually have a lot of knowledge and are happy to share it - and have you learn about their brand. Whether Rachel is a celebrity or an industry insider, it's important to make time to see her talk. You might come away with some fantastic business lessons or even just some inspiration to take home with you. Either way, Rachel is likely to have some great insight about pet industry trends that everyone's going to be talking about the week after the show. Don't miss out! Click here to access Global Pet Expo's seminars and learn more about pet industry trends at the show. A non-fat vanilla latte with soy milk. That's what Kevin just had a drink of. How can you tell? Well, Kevin is really interested in what he has to sell you - so much so, in fact, that he is in your face. Literally. This is a good time to take a step back and possibly offer him a mint. Or maybe just take the product information sheet and get out of his booth as quick as you can. Don't like close talkers? That's cool. Kevin won't be at any of our booths, so you can come and hide out with us. Jane is at the show for only one reason: she's looking for a new job. She may be attending under her current employer's dollar, but she's actively on the lookout for new opportunities. You're sure to find her at all the networking events and stopping by everyone's booth to drop off her resume and business card. There's not really much to do about Jane's attendance other than learn from her behavior so you can identify whether any of your employees are showing similar traits. Brad's just at the show for the great weather and a good time with fellow pet industry professionals. The problem is that Brad himself isn't very professional. On the bright side, he knows how to have a good time. If you're looking for someone to grab drinks with to unwind after the show, hanging out with Brad will guarantee a fun night. Just maybe don't try to keep up with him, or you'll regret it the next day when Kevin is in your face. While talking to Julie, you'll probably find yourself saying, "I'm sorry, can you repeat that?" Julie may be very friendly and knowledgeable, but she's just not used to being around people - especially when there's hundreds of thousands of them gathered in one space for three days straight. Take it slow with Julie, ask her questions that will bring her out of her shell, and if worst comes to worst, offer to continue the conversation after the show via email where she will probably be a little more comfortable to tell you about her brand. This is probably the most common type of person you'll find at pet trade shows like Global Pet Expo and SuperZoo. Sandra is not going to take no for an answer, at least not without putting up a fight. She will probably hand you a pile of product catalogs, make you stand for a 20-minute sales pitch in the middle of the trade show floor, and make you leave her booth so frazzled that you don't even know what just happened. You may not be particularly fond of her, but you'll probably be going home with a brand new dog treat line, wondering, "how did that even happen?" Enjoy the infographic further exploring the 10 types of people you'll find at trade shows. It was created by Exhibit Edge and used with permission.